These days, we know that almost everyone does Internet research before contacting a person or business. But how well is your website doing its job? You can test your website’s effectiveness by uncovering trends with analytics, which can then be used to drive your business decisions. Here, my colleague, Tori Ahmed, and I will discuss how tools like Google Analytics make diving into the numbers relatively easy. But first, let’s briefly discuss how to attract prospects to your website. With so much competition, getting people to your site should not be left to chance. Fortunately, there is a methodology by which you can help drive traffic to your site: search engine optimization (SEO). It can range in scope from simple to very complicated. For our purposes, let’s focus on the simple things you can do to move the search needle. Establish keywords. Brainstorm a keyword list that includes terms specific to you and your practice. Keep in mind that keywords and phrases should reflect how your audience would use them. For example, think of the different ways that a millennial might search versus someone who is a baby boomer. Use meta titles. Each page of your site should have a unique title that describes what the page is about in 60 characters or less. Create meta descriptions. For your site to build authority (i.e., a score that predicts how well a web page will rank on search engine results pages), search engines must understand the site content. Unique meta descriptions of around 275 characters help search engines rank your pages and present them in response to prospects’ queries. 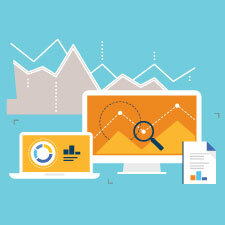 Once your site is up and running, it’s time to begin uncovering trends with analytics. A free version of Google Analytics can help you learn about your prospects and clients, including how they interact with your site. Signing up for a Google Analytics account is easy, but you will have to add one piece of code to each page on your site. How many unique visitors came to my site? What page or content item received the most traffic? The least? On average, how long is a visit, and how many pages are viewed? What is the demographic of my audience? 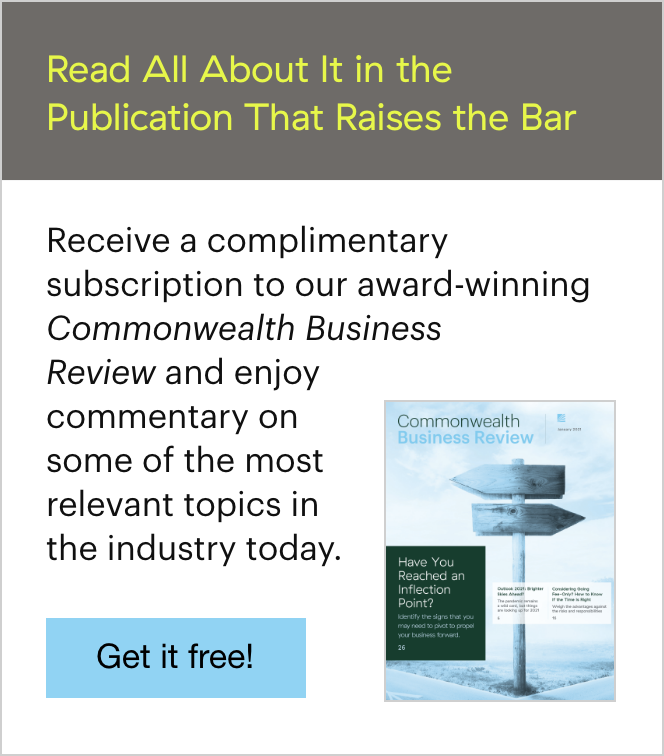 Are my landing pages driving conversions? What topics are people searching for? But having these numbers is just the beginning. Now it’s time to put them in context. Whether you’re using Google Analytics or another tool, the resulting numbers are just that . . . numbers. To have any meaning, you need to view them in context. 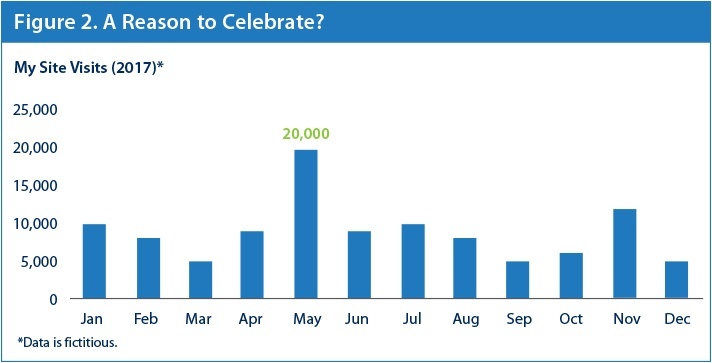 For example, if you discover that you had 20,000 site visits in May, would that be cause for celebration or distress? Figures 1 and 2 illustrate that the number “20,000” could be positive or negative—depending on traffic history and other factors. 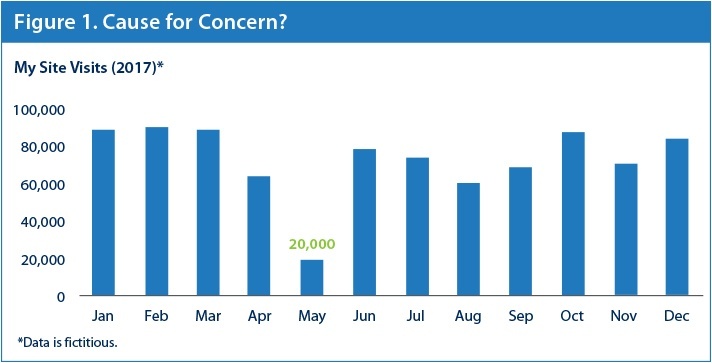 In the first scenario, 20,000 visits in May was low compared with visits in other months and indicates that something happened to impact traffic. Perhaps it was an unsuccessful marketing campaign or a change of strategy. When looking back at May in previous years, however, you might discover that it is simply a slow month for your business and, therefore, no cause for concern. In the second scenario, it is evident that something caused a spike in visitors in May. Before you celebrate, pinpoint exactly what led to that increase. It could be an e-mail that resonated with the audience, resulting in increased traffic and an uptick in phone calls to your office. If so, you can celebrate—and should consider duplicating this strategy in the future! But if greater traffic did not result in more successful calls to action, you should investigate why. One cause could be a campaign that did, in fact, attract prospects to your website and drive a lot of clicks. But when prospects landed on your site, they may have realized that the message in the external campaign did not align with your website content, so they left without taking any action. You should view your traffic month over month and year over year to see if there is seasonality or other external influences. Examples of seasonality would be planning that takes place at the end of the year or during tax season. External influences can include tax code changes, a need for estate planning, or a life event (e.g., new job). When you identify the high-traffic times for your site and audience, you can better plan when you release valuable information or send relevant e-mails. Once you understand your audience and how they interact with your site, try to provide each segment with the content that is most relevant to them and their life stage by guiding their user journeys. Each call to action should provide the visitor with the opportunity to engage with you or your site content. Of course, different audiences will have a preference for how they ingest your message. Some may prefer to read, some to watch a video, and others to speak directly to a person. Regardless, your goal is to drive as many people as you can down their designated path and, ultimately, turn prospects into clients. You can then use analytics to track your conversion success and discover which type of activity is most effective with each audience. Are You Ready for the Big Leagues? One of the advantages of using a tool like Google Analytics is that you don’t have to spend a lot of time analyzing data. You can get as high level or as granular as you feel comfortable with and then use the data to answer those questions that are important to your business. 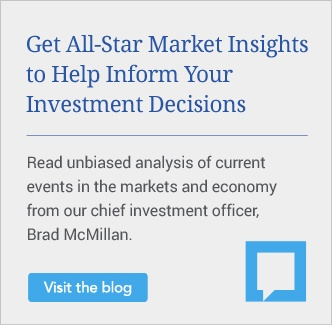 The key to successfully uncovering trends with analytics is to establish a regular routine for checking in on your findings. With that game plan in place, you will be ready to take your website to the big leagues! How do you attract prospects to your website? Have you used Google Analytics to help you make more informed business decisions? Please share your thoughts with us below!